As a general rule, it only takes somewhere between 15 and 30 minutes to repair a rock chip. It is an effective, economical and practical way to restore the overall structural integrity of your windshield without having to cough up the dough to replace the entire piece of auto glass. It is worth noting that all rock chips aren't repairable. Sometimes, a full windshield replacement is necessary. How Exactly Does Rock Chip Repair Work? When there is a rock chip in your windshield, it will be repaired by using a resin that is curable via an ultraviolet light. The resin is injected into the damaged area and then cured. 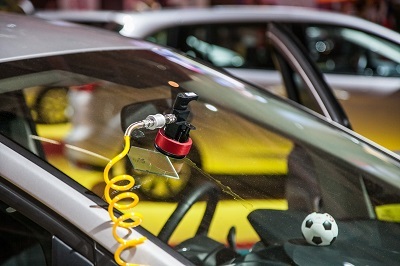 The curation process creates a solid bond between the separate parts of the windshield in order to keep the damage confined to that one spot. It keeps it from spreading to other areas of the auto glass. Not all rock chip repairs are successful – only about 98% actually are. This is because there are numerous uncontrollable variables that go into the results of a repair, including type, age, size and location of the break. Although you have had your rock chip repaired, your auto glass is still broken. The repair only keeps the damage from spreading to other areas of the windshield. A repair should never be for cosmetic purposes. This is because the visibility of the damage will decrease, but it is typically still present and at least somewhat noticeable. Whether you want to get rock chip repair and wait on replacing the auto glass or you want to get a windshield replacement immediately, give us a call at Only 1 Auto Glass here in St. Paul, MN. We proudly serve the entire Twin Cities area and want to make sure that you're safe while driving on the road. If your windshield has been damaged in any way, then your safety is compromised. Give us a call and let us repair or replace your vehicle glass so that you can have a little bit of peace of mind while driving on these hectic Minneapolis roads.